Update: Launch has been postponed till Saturday 4:47am EDT due to a steering issue that stopped the clock one minute before liftoff. Update: Landing was partially successful. The first stage managed to reach the landing spot, but the steering fins ran out of hydraulic fluid. Next attempt is scheduled for three weeks hence. If tomorrow's experiment works, and if the returned first stage does not need a lot of maintenance, then this changes the world. Launch prices will fall dramatically and launch rates will increase accordingly. This in turn will open up a revolution in space-related activities; everything from affordable global Internet coverage, to mining asteroids, to colonising Mars. 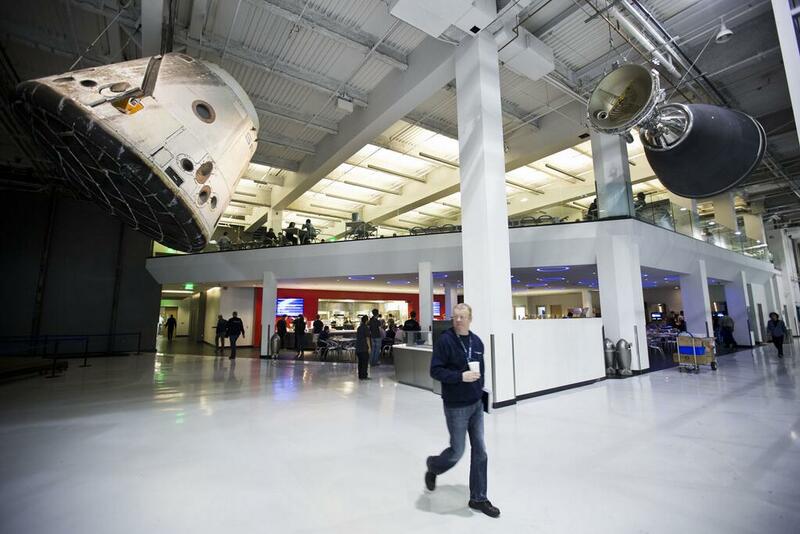 Last year Quynh and I toured the SpaceX factory in Hawthorne, California. Getting me inside was problematic given my lack of US citizenship, but after several months of pushing we made it. Photography was forbidden (the links below are to other people's photos). A non-communicative security guard kept a close eye on me throughout. ITAR is no fun. But the tour certainly was. The front third of their facility looked familiar, rows and rows of cubicals with engineers working at computers. Other than the presence of an old Merlin engine in the hallway, it was virtually indistinguishable from any Google office. Going deeper into the building we passed the server room. Two isles of server racks, bathed in blue, with a prominent "Cyberdyne Systems" logo. Standing guard across the hall was a full-size Cylon. Spaceflight has an insatiable demand for computers to run computational fluid dynamics (simulating airflow around a rocket or plasma around a heat shield), so seeing a decent-sized server room was not surprising. Then we went through a set of double doors and onto the factory floor. It is enormous, it was hard to see the far end of the building. Our guide said that the building was originally used to build 747 aircraft (though based on the insufficiently long runway outside, I suspect that he meant 747 aircraft components). Despite the size, the building was bursting at the seams. The cafeteria and mission control sit on opposite sides of the entrance. Hiding above the cafeteria is the little studio where launch webcasts are made. 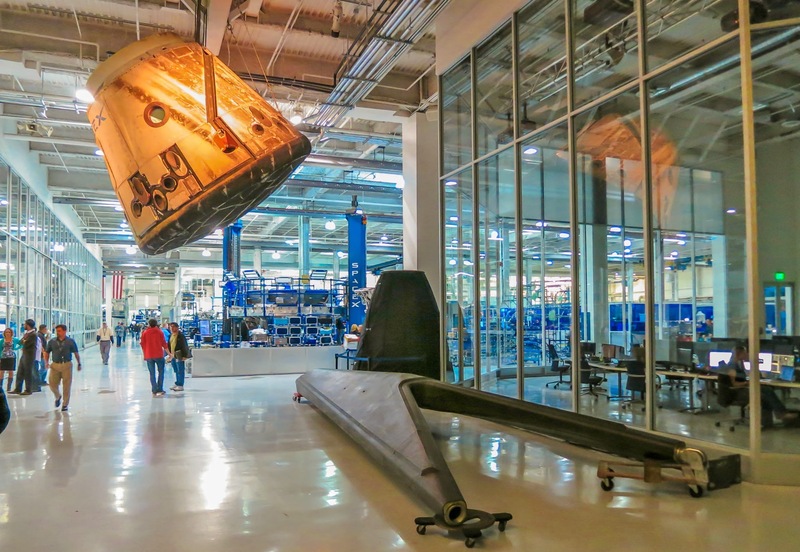 The first Dragon capsule and a landing leg decorate the entrance. There's also a Merlin vacuum engine hanging from the ceiling. 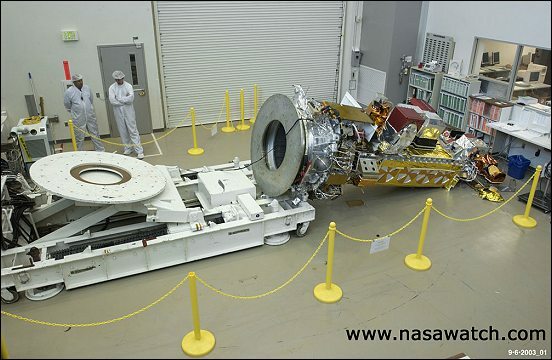 Moving further inside, enormous tooling is used to integrate the nine first stage engines onto the octaweb. Engines are made here, sent to Texas for testing, then brought back for integrating with the rocket, which is then sent back to Texas for another round of testing, before being sent to a launch pad. 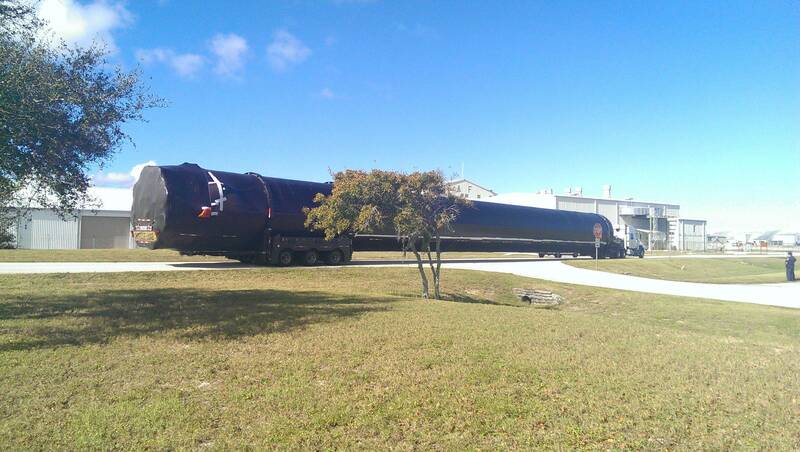 This amount of travel means that the Falcon 9 is optimised for ground transport. Just throw it on the back of a tractor trailer and hit the road. They'd like to make Falcon a larger diameter, but that would mean that transport would have to be done by aircraft, increasing costs. Payload fairings are large and their construction takes up a surprisingly large area. The original design was to have four quarter fairings, for ease of transport. However, these turned out to be too flimsy, and SpaceX switched to two half fairings. The largest robot arm I've ever seen was preparing to do non-destructive testing of a completed fairing, looking for internal voids or other structural defects. An assembly line of Dragons was in full swing. One could see the progression from newly-welded pressure vessels at one end, to fully functional spaceships on the other. The last few were in a clean room as the final insulation and wiring were installed. 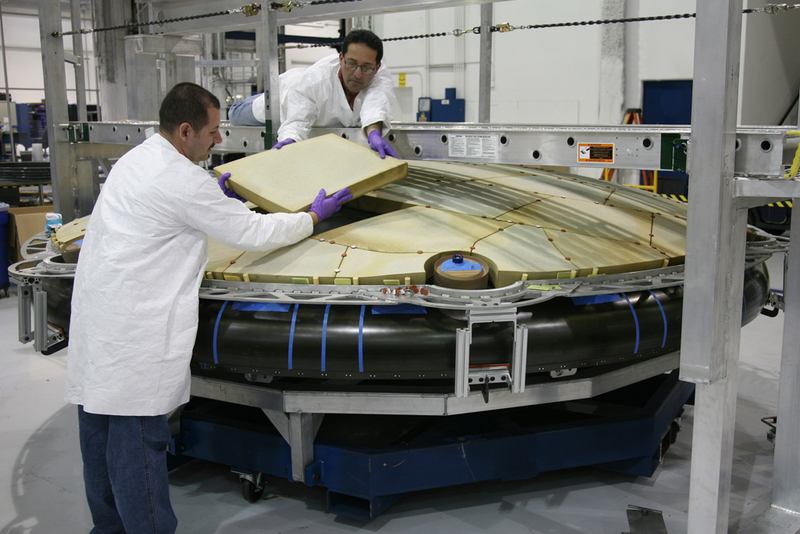 Heat shields were also being assembled and one completed shield flew overhead carried by a gantry crane, presumably to meet its Dragon for the first time. Nearby was an array of 3D printers hard at work building metal parts. Our guide wouldn't say what they were printing, just that they were testing the technology. With the benefit of history we now know that they were printing valves and SuperDraco engine chambers. Rocket stages are basically just made up of two types of aluminum components: rectangular sheets that have been rolled into a curve that form the walls, and three circular domes (one at each end and one in the middle that separates the liquid oxygen tank and the fuel tank). These domes were originally manufactured by an aerospace company named Spincraft (I remember Elon Musk praising their work many years ago), but once SpaceX became successful, Spincraft allegedly raised the price through the roof. Without domes, all SpaceX could build were empty tubes. Rather than be held hostage, SpaceX located a dome spinning machine in an old factory in what was once East Germany, brought it to California, and started making domes themselves. By far the biggest surprise of the tour was the workforce. I've been to many aerospace shops and one always sees the same thing: The Hardware sitting at the geometric centre of the room, and three people next to it. One person carefully tightens a nut. The second monitors the first person while holding his own hands behind his back. The third documents the work on a clipboard. This system evolved with the understanding that humans make mistakes, so a process is needed to prevent these mistakes. A conventional aerospace shop is like a monastery, it is a solemn environment. SpaceX is the opposite. The building echoed with the sound of power tools and hammers. The modular overhead cranes were constantly in action. Nearly everyone was working on their own. 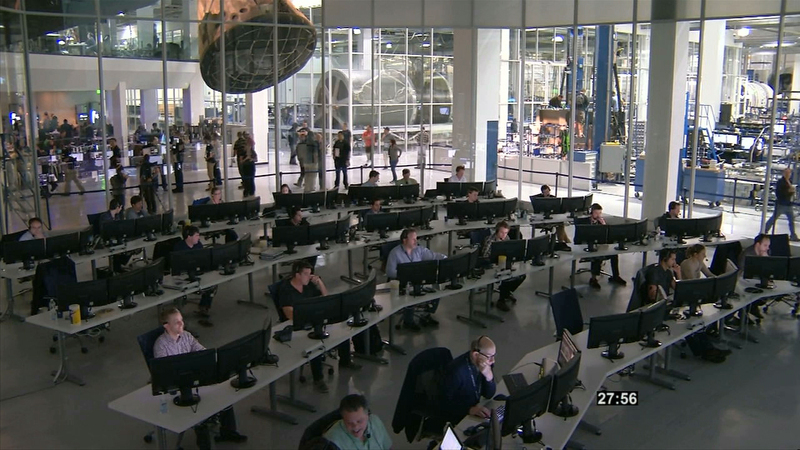 SpaceX's factory floor is reminiscent of a locomotive factory. Mistakes are inevitable, but with the rigorous test process mentioned earlier, they get corrected before launch. And with ever increasing automation, simpler designs, and increased production rates, fewer mistakes get made in the first place. Visiting SpaceX was an amazing experience. I saw how determined they are to revolutionise the industry, and our world along with it. Make that "our worlds". Because tomorrow's test flight is the beginning of a new journey beyond our current home. And if tomorrow's test fails, the one after that is less than a month away. That one is going to be even more interesting: the first stage will head back to Earth, while the second stage will be disposed of into the Sun!